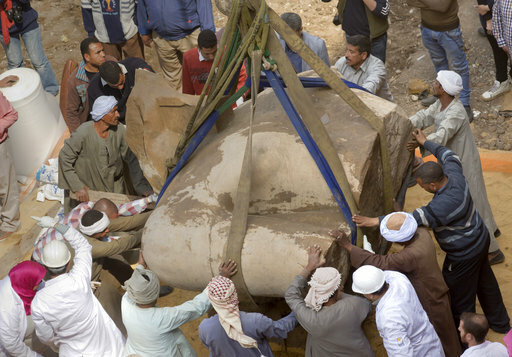 CAIRO (AP) — The three-ton torso of a massive statue that may be of one of Egypt’s most famous pharaohs has been lifted from mud and groundwater where it was recently discovered in a Cairo suburb. The torso was pulled by a crane as dozens of workers supported it while being moved to dry land Monday. The first part of the colossus — a large portion of the head — was pulled up Thursday. The Ministry of Antiquities says the statue’s parts would be assembled at the Egyptian museum in central Cairo, where they would be pieced together and restored before being moved to the yet-to-open Grand Egyptian Museum near the Giza Pyramids. 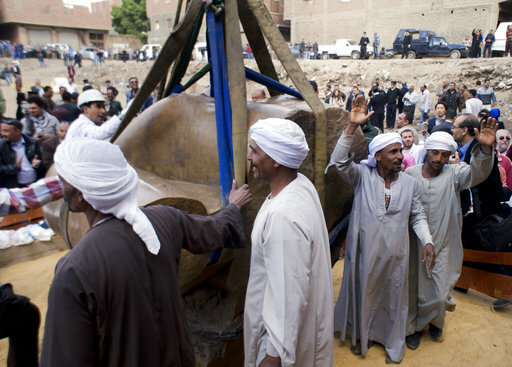 The statue is likely of Ramses II, who ruled Egypt for 60 years more than 3,000 years ago.